Bond Economics: Higher Debt-to-GDP Means … Lower Bond Yields? Higher Debt-to-GDP Means … Lower Bond Yields? This article addresses one issue regarding Fed “Tapering” (reduction of bond purchases, or Quantitative Easing (QE)) that I had not previously discussed: the impact of Fed purchases on bond yields. To recap my earlier article, I argued that QE had no impact on the economy as a result of the change of size of the Fed’s balance sheet. But did QE lower bond yields as a result of the increased demand for bonds? In this article, I begin to outline why I think supply and demand factors have limited impact on the level of bond yields. Update: The analysis within this article has been adapted to appear within the book Understanding Government Finance, which was published in 2015. The book is an introduction to the operations of government finance, and has a discussion of what determines bond yields. 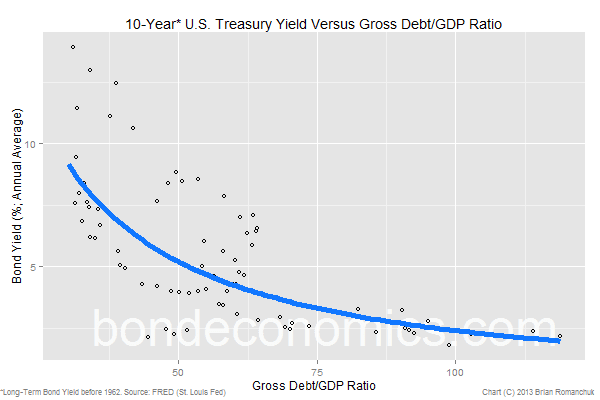 When we look at a scatter diagram of bond yields versus the debt/GDP ratio, the relationship does not meet intuitive expectations. 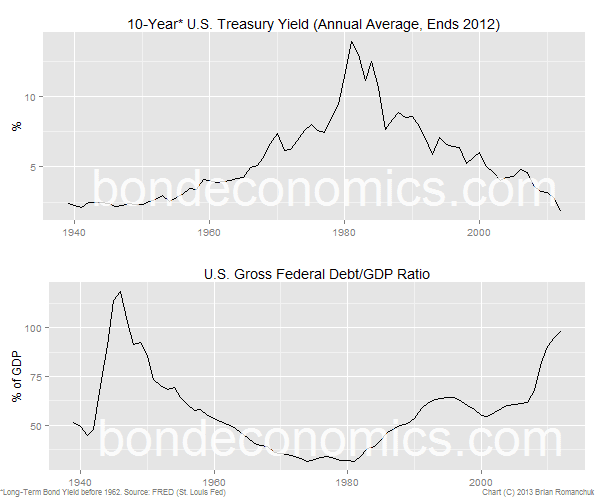 A basic fitting of the data* shows that increased debt/GDP ratios are associated with lower bond yields. It seems somewhat surprising that this fairly strong relationship regarding debt/GDP ratios and bond yields is not heavily publicised. I would suggest that this is because it does not meet heuristic views about government finance – we see that increased supply increases the price! I have seen dozens of sophisticated attempts to replace the downward-sloping trend in the above chart with an upward-sloping relationship; however there is no way I could cover them all within this one article. To be fair, one needs to keep in mind the "financial repression" that capped bond yields during the 1940's and 1950's. But in any event, even if one could find some means by which rising debt implies higher bond yields, the effect has to be very small to be consistent with the observed data. Although this analysis is not applied to QE in particular, it is the beginning of an argument that supply and demand factors are of secondary importance for the determination of bond yields. This explanation has been well covered by Modern Monetary Theory (MMT) writers, among others. (For example, Warren Mosler and Bill Mitchell.) Over time, I will look at the issue of supply and demand in more detail, given the importance of this topic to many bond market participants. * If you wish to reproduce these results, I regressed the logarithm of the yield on the logarithm of the debt/GDP ratio. This is the easiest way to get a fitting of the obviously nonlinear relationship in the scatter diagram. A linear regression will have problems fitting the data.